Tantei San wrote: What did you do in the previous post swagnarok? I cannot understand. Maybe he got cut off when typing. PhantomWriter wrote: Kuroda and Wakita's reaction to Wakasa's actions is interesting. Also two of the them have artificial/damaged eye and the other may have one too under her glasses. But i'm still believe they aren't the real RUM. Like i said before... RUM doesn't have much reason to be around Kogoro. BO may have concern about him because of his fame but he still not involved with any BO case after the assassinations attempt. Also if the member of BO spying Kogoro and found out he is gambling, watching tv, and do useless thing.. they won't add him in their radar anymore. I think he was just showing that he agreed with PhantomWriter. Kuroda doesn't use a cane,... you mixed him up with Kansuke. Wakita is the oldest among all of them. Kuroda is 50, Wakita is 56.
unless he figures out who the real "sleeping Kogoro" is. my mistake... Yeah you are right.. it is kansuke not kuroda who use a cane. Hmmm... Then conan would be in real trouble right now. Themaninarmor wrote: Hmmm... Then conan would be in real trouble right now. Btw, Could It be possible that instead of ASACA RUM be denoting one single person, Could be two person. Like ASACA AND RUM who were involved in the Kohji haneda's case 17 years ago. If by that theory I would it has to be Kansuke and Kuroda as ASACA and RUM resp. Besides the photograph of ASACA that was shown fits perfectly with that of Kansuke and Kuroda should have to be RUM. And if BO can have moles in the org. why can't the police force have BO's moles. After all Kansuke and Kuroda have been working together for a long time, It is possible. Thanks for the info, Serinox. Good to know that the ambiguity of "spirit" is there and the translation issue being just a flub. The Kohji case had a lot of scattered information. Although it's limited, we have gotten many clues that are worth discussing. As we know, The 17-year-old double-murder was done by the Black Organization. This was a cemented fact, the moment we found out that Kohji's name was written in the APTX list(the list of victims that were drugged by the organization's experimental drug)(File 947). Then, it was established that Rum(BO's current second-in-command) was the culprit, through Gin(File 953). The victims were Haneda Kohji and Amanda Hughes, and the prime suspect was Asaka. We also know that Akai Tsutomu was involved. In total, we have 5 important players in this case, and I'll be going though each one of them. Haneda Kohji was a shogi-player and had come to the US to participate in a chess competition. The day before the competition, he was killed in his hotel room. What we know from that "Kohji website"(which contained the details surrounding that case) is that he was visited by Amanda Hughes(a huge fan of his), before his death. The reason this was "assumed" was because her fingerprints were found on different places inside Kohji's room. Since her fingerprints were found on teacups, sofa and knife & forks, it is assumed that they were sitting on the sofa, drinking tea and eating snacks while having a chat(File 948). After Amanda left, he was later assaulted by Rum, the culprit of that case, and the defensive wounds in Kohji's arms, including the broken crockery and smashed cups, suggested that he was struggling against him until he was forced with the prototype drug(made by Sherry's parents). For an unknown reason however, Rum had fled the scene, before cleaning up the messy room in order to make it look like nothing happened(following the BO's M.O)(948). Because of this, Kohji was able to leave a dying message, by "cutting" out specific letters from a hand-mirror after putting it under hot water. This was assumed due to the fact that his hand had marks that suggested that he was gripping a pair of scissors very tightly, and that the sink in his room was left open, as well as that a hand-mirror with missing letters was found. The missing letters were "*U* ** MASCARA"(derived from "PUT ON MASCARA"). As we know, Conan's(and the rest of the cast's) interpretation of the dying message was that the removed letters "U MASCARA" was the message itself, and that it could be rearranged as "ASACA RUM", and could be seen as "Asaka is Rum". Whether this is the true interpretation or not, or whether the arrangement is even correct, is still a debate, but that it coincides with the names of two important players in this case is a hard fact. There are two incidents that needs attention. The first is Kohji's clearly highlighted meeting with Amanda, not long before his death, and the second is Rum's sudden escape from the crime scene. These two holes in the "Kohji website info" most likely plays a big role in the overall case development, since they are left vague by Gosho because he's planning on filling them in later on. Amanda's conversation with Kohji therefore carries a hidden development. Going by Haibara's assumption, Amanda was most likely Rum's target, and Kohji was most likely targeted by Rum because he was affiliated with her and had met her very recently(which, again follows the M.O of the BO, since they try to erase any potential leads to them). If Kohji wasn't directly connected to the BO, then there's no way for him to know about the BO members' code-name(as assumed by Conan). Considering that Rum left the scene right after his attack(second hole), there shouldn't have been a moment were his code-name could be heard by Kohji. If Conan's assumption is true, is it possible that Amanda's conversation with Kohji(first hole) played an important role in this scenario? Depending on Amanda's affiliation with the BO, she could have potentially shared information about the BO/Rum with Kohji. This does however raise the question of why she would go to Kohji(of all people), her favorite shogi player that happened to visit the US for a match, to share that dangerous information. From the knowledge that we currently have regarding Kohji's and Amanda's relationship, it does seem out of place and too unrealistic to be the case, which by extension makes the assumption that Kohji knew about the BO/Rum, as well as "ASACA RUM" interpretation, less likely. The second hole suggests an interference, or an urgent development, that forced Rum to leave the scene. This sudden development lead to Kohji being alone in the room, followed by him leaving the dying message. Assuming that Kohji didn't know about Rum/BO(in other words, "ASACA=RUM" is incorrect), it would mean that his message could have been mainly one of three things. The first possibility is a warning. If he for some reason had a suspicion about the killer's original target, or the next target, then his message could've served as a warning for that target(like in File 133). The second possibility is the identity of the culprit. Like the majority of all dying message, this message could have been revealing the culprit's identity, meaning that Kohji recognized Rum and knew his name(Examples:"karasuma"/"Sakamura"/"Masakura"[a sake name apparently btw]/etc.). In this case, it would mean that Rum is a famous figure, similar to Chris Vineyard(Vermouth). Since we know that Kohji was struggling against Rum, it wouldn't be strange if Rum lost his disguise(hat/cap/mask/etc) in the middle of it, and ended up revealing himself to Kohji. If Rum wasn't a known figure however, it's possible that Rum had distinguishable characteristics/features that Kohji was alluding to in his message(like scar/age-group/gender/symbol). The third possibility is a final word. From the very beginning, this could have been a message intended for a loved one, or someone else that he wanted to relay a final message to. It's also possible that the message had more than one meaning, but with the restrained time, it's unlikely. Overall, considering that he had alphabetic letters to work with, and since he's in the US, it's not a stretch to assume that the message can be read by non-japanese speakers, but it's also possible that the message relies on knowledge that he's the most comfortable with, like shogi and chess(interestingly enough, the numbers in chessboards fits with the number of letters in the message). 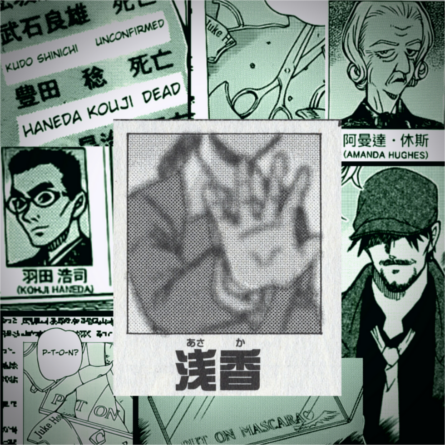 Amanda Hughes was an old wealthy and influential person who was Kohji's fan. Just like with Kohji, she was killed by Rum. Although her name was never seen in the APTX list, her mysterious death suggests that she died from the prototype drug(which leaves no trace after being digested). According to Haibara, Amanda was most likely the organization's target, due to her powerful position in society, and she even had connections to the FBI & CIA(File 948). Before her death, as mentioned, she visited Kohji to chat about something. After the visit, she died after digesting the prototype drug. The fact that there was no indication of a struggle, and the that the room was left tidy, means that Rum successfully followed the BO's M.O, which by extension makes the fact that the Kohji crime scene was a mess even more suspicion. Somehow, Amanda got herself a bodyguard that she called "Asaka". The bodyguard Asaka disappeared directly after the murder, ultimately making him/her the prime suspect. Even close acquaintances of Amanda were clueless as to how she hired Asaka, meaning that it was done secretly for some reason(948). In Amanda's case, we can once again find another important hole in the information. The third hole is the mystery behind the way Amanda hired Asaka, and why. An influential person like Amanda hiring bodyguards(for no reason) is nothing uncommon, but the fact that it was hidden from her close relatives and acquaintances suggests that there was a hidden motive behind it. If she was aware of the BO's plans to assassinate her, then it would explain her secret activities. For her to be aware of it however, it would imply that she's connected to them in someway. Seeing as she's a wealthy woman, it's very likely that she was investing money to the BO(possibly for their research). The fact that she didn't seek help from her FBI/CIA contacts(as far as we know) suggests that she might have been avoiding them(possibly due her involvement with a criminal organization). The fact she might be aware that her life is in danger might be due to her doing something that she knows went against the BO's wishes. It could've also been a mistake on her part, that she knew was unforgivable. Another reason could be that she fell under their suspicion, due to her ties with the FBI/CIA being accidentally revealed, leading to the BO losing their trust on her(whether she was spying for them or not). So how did Amanda hire Asaka? Going by Conan's assumption("ASACA=RUM"), it would mean that she unknowingly secretly hired Rum, a BO member. But if her secrecy is due to the anticipated BO threat, then that would mean that she hired the "threat" himself to protect herself from it. That kind of mistake is very alerting, since you would assume that someone who's likely fearing for their life would be extra picky and careful with the people they hire. Also, if she really did that mistake, it would mean that Rum had all the time to kill her, before they arrived in the hotel, but not only did he let her live up to that point, but he also let her meet Kohji, which lead to him having to unnecessarily kill him afterwards(and ultimately make mistakes). Following this line of thought, it's very unlikely that Amanda hired/met Rum before she visited the hotel(assuming again, that "ASACA=RUM" is true). If this is the case, it also seems quite unlikely and unsafe for someone in her position to meet/hire someone, that she hasn't met before, in a public place like a hotel(especially if she was aware of the BO threat, hence her secret hiring). This makes the overall "ASACA=RUM" interpretation even more improbable. If we were to ignore Conan's assumption, then all these inconsistencies that we currently have disappears. This still leaves us with the question of how Asaka was hired. If we consider the the first hole in the "Kohji website info"(Amanda's meeting with Kohji), then it could potentially fill this third hole(Asaka's hiring). If Asaka was hired during Amanda's meeting with Kohji, then it could explain why the hiring was such a mystery to everyone close to her. What this would imply is that Asaka was originally Kohji's bodyguard, who came with him to the US. As I addressed before, the likelihood that Amanda would reveal dangerous info about the BO to a shogi player, that she happens to admire, is very unlikely. It's not as unlikely however that she might have addressed general worries for her life during her chat with him. This could've ultimately lead to Kohji having his trusted bodyguard Asaka assigned to Amanda, as extra precaution, during her stay in the hotel(if not until the competition the next day), in order calm her nerves. As I mentioned in my Rumi discussion, there are certain contradictions about Asaka. To summarize it, if Asaka is Rum, then Asaka can't be a woman. The thing that suggested to Hotta, as well as Conan, that Asaka is female is the fact she was seen carrying a hand-mirror. That hand-mirror was most likely the same hand-mirror that Kohji used for his dying message. This is another clue that could help us shed some light to this Asaka mystery. When Agasa asked if it was Amanda's hand-mirror, Haibara mentioned that it's probably Kohji's and that it's normal for Shogi-players to care for their looks, but that it also might've been given to him by someone(File 948). This looked a lot like Gosho's way of alluding to the truth, like he usually does with Conan(when the last thing he points out after his previous points ends up being the correct one). Kohji being given the hand-mirror by someone is most likely the truth. What we also need to take into consideration however is that Asaka was at some point seen with a hand-mirror(File 953). Again, if we look at it through the "ASACA=RUM" mindset, it would imply that at some point, the hand-mirror went from Rum to Kohji(since Rum fled the scene before Kohji left the message with the hand-mirror, and since the room was never cleaned up, Rum likely never returned). The only possible way for that to happen is if he dropped his hand-mirror during his struggle with Kohji, but that still raises the question of why Rum carries a hand-mirror to begin with. It's not a rule that only females can carry it, but from Gosho's depiction of that plot-point, we are supposed to see gender-stereotypes as the norm. Taking this fact into consideration, including the implications that the hand-mirror was most likely given to Kohji, once again lessens the likelihood of "ASACA=RUM" interpretation to be true. If Asaka was originally Kohji's bodyguard however, it would explain why Asaka was seen with it and how it was given to Kohji. This would imply that Asaka is indeed a female bodyguard, who shared her hand-mirror with the person she's hired to protect, Kohji. If we were to follow this line of thought however, we come to the realization that even after Asaka was assigned to Amanda, by Kohji, Rum still managed to kill her. The tidiness of the room suggest that a mess wasn't created, or that he successfully cleaned after himself without interference. Right after killing Amanda, he went straight to Kohji's room, but what happened to Asaka? If there was never a mess in Amanda's room to begin with, then it's possible that his attack on her wasn't as straightforward as when he dealt with Kohji. Rum could've planned out the best strategy to poison her without having to directly force it into her. With this possibility in mind, it wouldn't be impossible for Rum to have overlooked Asaka(who he didn't expect to be in Amanda's room as she unknowingly digested the poison). How he directly dealt with Kohji, using force, indicates that Kohji's assassination was most likely an urgent last-minute-plan(after finding out about his meeting with Amanda). That's when the second hole comes into the picture(where Rum, for an unknown reason, suddenly flees from Kohji's room, after forcing him with the drug), and after Asaka realized that both of them were dead, she likely fled due to all of it looking like she did it(especially since she was in both of their rooms). If Rum directly attacked Amanda as well however, and then later cleaned up her room, it's also possible that he in fact did attack Asaka along with Amanda, and forced her with the drug, after finding out that she was Kohji's bodyguard(meaning that Kohji met Amanda). Although we have no clues to shrinking side-effects of the early prototypes made by Sherry's parents, it wouldn't be unreasonable to consider the possibility that Asaka shrank, which in turn would explain her sudden disappearance after Kohji's and Amanda's death. Pisco's line about Sherry's prototype's shrinking effect suggests that her parents never got their research that far(File 242), but Pisco's knowledge could've easily been limited as well. In this very case(FIle 948-950), there are two important groups that were name-dropped, the FBI & the CIA. These drops were most likely intentionally setup by Gosho for this very hint to be established. Akai Tsutomu was involved for a reason, and it was most likely connected to Amanda, who was targeted by the BO and had ties to both the FBI & CIA. The fact that Subaru left an ambiguous "but..."(as if an alternative answer was underway before he interrupted himself), right after denying that his father worked with the FBI, indicates that Tsutomu must be working with the other alternative, that was recently mentioned alongside the first alternative, the CIA. It's a clever story-telling tactic to hide the answer while at the same time leaving it right under the reader's nose. His involvement with a case that takes place in the US(even though his family lives in the UK) further indicates that his father was tied to the country in someway(which makes sense if he was a CIA-agent). Adding to the fact that Akai had an unknown source that possessed CIA intel(File 595) further hints towards this direction. His goal was most likely Amanda Hughes. It's possible that the CIA picked up on her suspicious activities that connected her to the BO(her possible investments for example). Whatever the reason was, it lead curious Tsutomu to the hotel. What we later find out is that Tsutomu disappeared after Kohji's and Amanda's death, similarly to Asaka. Mary reveals that he apparently sent a final message during his disappearance, warning his family that "he made enemies with really horrible people" and that they should flee to Japan and act like he's dead(File 972). This was followed by Akai, who thinks to himself about his father's body not being found. Tsutomu said that he had "made enemies" with some really "horrible people". This was clearly alluding to the BO, but what is interesting to note is that he said that "he made enemies". This is a clear indication that Tsutomu stood against the BO during his involvement in the Kohji case, meaning that he interfered with their activities, which lead to him becoming their target. This very situation that he got himself into coincides awfully well with the second hole in the "Kohji website info"(Rum's sudden escape from Kohji's room) and could potentially be the answer to it. The reason to why Rum couldn't follow the BO's M.O in Kohji's room and instead fled could be due to Tsutomu's interference. After finding Amanda's corpse, Tsutomu might've run straight to Kohji's room and encountered Rum, who had just forced Kohji with the drug. The fact that Akai was talking about "a dead body not being found", indicates that there were most likely signs of Tsutomu's potential death(but with no trace of a body). The usual signs of death is if blood is found in a crime scene. If Tsutomu's blood was in Kohji's room, then it's very likely that a fight took place between Rum and Tsutomu, ultimately leading towards Rum's escape and Tsutomu's disappearance(after realizing the trouble his family could get into). While Rum was distracted by Tsutomu, Kohji would have the little time that he needed to leave a message, as he's slowly dying by the drug(similarly to how Shinichi struggles before the shrinking-effect kicks in). This scenario would imply that Akai Tsutomu is still alive(if there's no future development that would suggest otherwise). In this whole case exposition(File 948-954), the only hard facts we have regarding Rum and the BO is that Rum screwed up his job(File 953), and that the BO is aware of the dying message, and that it can be read as "ASACA RUM"(File 954). This very limited information doesn't tell us much about Rum, or if "ASACA=RUM" is true, but it does imply that Rum's mistake is connected to the second hole(Rum suddenly fleeing from the scene). Following my previous potential explanation to that hole, it's possible that Tsutomu was the cause to Rum's escape, which lead to all the mistakes that followed with it(The M.O not being fulfilled, Tsutomu not being dealt with and Kohji managing to leave a potentially-dangerous message). Now, taking Conan's assumption to consideration, the message would clearly pose a problem to the BO. But if we look at it from the second perspective(dismissing Conan's assumption), it would mean that another weight is added to Rum's mistake, Asaka. Her disappearance is clearly another problem that highlights Rum's mistake from 17 years ago, since the "Kohji website" keeps reminding them that one person, that was involved, managed to escape(whether Asaka was overlooked at the moment of the crime or not) and could pose a threat if they(Asaka) possess threatening information. Them investigating anything that involves "ASACA RUM"(the dying message) wouldn't be surprising, if Asaka is still being searched by them and that the message might be connected to her. When Agasa was surprised by the amount of detail in the Kohji website, Conan revealed that the website was taken down multiple times, but the uploader kept putting it up continuously as if they were desperately seeking help(File 948). This was then followed by Agasa emphasizing the suspicious "minute detail" that the website had regarding that case. This was clearly Gosho's way to hint us that the uploader was someone that was there and participated in that case in someway. Currently, there are only two players in that case that would have a reason to seek help, Tsutomu and Asaka. Taking once again Conan's assumption into consideration, it would mean that the uploader is Tsutomu, or someone that Tsutomu shared the details with(which in that case would exclude Mary, since the implications in File 972 suggested that the text was the only thing he sent to her). If we again disregard Conan's assumption, it would leave Asaka as an option too. The narrative in the website is done as if it's from a neutral person. This is a clever move if you want to avoid suspicion by the people that's hunting you. With that in mind, Asaka could've easily portrayed herself as the prime suspect, since she's aware that it's the first thing an outsider would see her as, after her disappearance(hence why she fled in the first place, if it wasn't because of a shrinking). If it's Tsutomu, then he might not even know if Asaka is Rum or not, unless Rum had distinguishable features/clothes that contradicts the Asaka photo. Whoever it was(Asaka or Tsutomu), it's very clear that Gosho is alluding to that the uploader is someone that was directly involved in that 17-year-old case. - An important development most likely took place during his meeting with Amanda(first plot hole). - The likelihood that Haneda Kohji had prior knowledge on the BO is currently low. - His dying message is more likely to be something that americans can also interpret, but it might also rely on knowledge that he's comfortable with(like Chess/Shogi). - The way she hired Asaka is important(third plot hole). - She was most likely connected to the BO in someway(hence why she was targeted), and her secret hiring of Asaka suggests that she was most likely worried for her life. - The third plot hole might be connected to the first, meaning that Asaka was assigned to Amanda during her meeting with Kohji(in other words, that Asaka was originally Kohji's bodyguard). - The hand-mirror was at some point with Asaka, and then ended up with Kohji, and the likelihood that it was given to him is high. - If the hand-mirror is Asaka's, and was given to Kohji, then the likelihood that Asaka is female is high(in other words, Asaka being Rum is low). - If Asaka is female, the reason to her disappearance could be due to wanting to avoid blame for the murders, or that she was also attacked with the drug, but instead shrank. - Tsutomu is most likely a CIA agent, and he might've been investigating Amanda's affiliation with the BO. - His text to Mary suggests that he took a stand that interfered with the BO's mission, ultimately making them his enemies. - His interference might be connected to the second plot hole, meaning that he interfered with Rum's assassination, and ended up helping Kohji leave a dying message. Tsutomu might've fought with Rum and bled, but successfully managed to fend him off and flee himself. - Rum's mistake is most likely the fact that he was unable to deal with the interference that lead to Kohji successfully leaving a dying message and Rum not being able to clean up after himself. - If Tsutomu was the interference, then his disappearance adds up to Rum's mistakes. - If Asaka is female, then her disappearance also adds up to Rum's mistakes, and the BO are most likely still searching for her. - The uploader is most likely someone directly involved in that case. - If Asaka is Rum, then the only alternative is Tsutomu, or someone he shared the info with(excluding Mary). - If Asaka is female, then the likelihood that the uploader is either Asaka or Tsutomu is high. If she was aware of the BO's plans to assassinate her, then it would explain her secret activities. For her to be aware of it however, it would imply that she's connected to them in someway. Seeing as she's a wealthy woman, it's very likely that she was investing money to the BO(possibly for their research). The fact that she didn't seek help from her FBI/CIA contacts(as far as we know) suggests that she might have been avoiding them(possibly due her involvement with a criminal organization). You're leaving out probably the most logical option here: that Asaka possibly was the help provided by either the CIA or the FBI to protect Amanda from possible threats. If Amanda would go so far as to use her connections to get one of those institutions to provide a bodyguard from her, I think it is likely that she was paranoid enough not to tell her relatives and acquaintances about Asaka's true background. Or the CIA/FBI advised her not to divulge that information. Either way, it would also explain why Asaka went into "hiding", since it would really just be an undercover agent going to his real life (especially if it was a CIA operative, I doubt they would want to have themselves involved in the regular police investigation). As you said, there is nothing that implies that Amanda avoided her government contacts and also nothing that implies she had ties into the BO. Perhaps it was a gift that Amanda had bought for Koji and Asaka carried it around for her? Or maybe Amanda accidentally took the mirror with her after her inital visit in Koji's room and asked Asaka to return it to Koji and Asaka was seen holding the mirror then, though this second option seems a bit more unlikely, given that a security concerned Amanda would probably not send her bodyguard off to another room to bring back a mirror, leaving her alone. Maybe it really it wasn't the same in the end. Haibara mentions that these mirrors that came together with the mascara were a big hit back then, so it's not that unlikely for there to be more of them around. I don't really have a decided theory on that atm, since that aspect is currently still vague. Serinox wrote: Perhaps it was a gift that Amanda had bought for Koji and Asaka carried it around for her? Or maybe Amanda accidentally took the mirror with her after her inital visit in Koji's room and asked Asaka to return it to Koji and Asaka was seen holding the mirror then, though this second option seems a bit more unlikely, given that a security concerned Amanda would probably not send her bodyguard off to another room to bring back a mirror, leaving her alone. Very true, but from a narrative standpoint, they are more likely to be the same. Gosho could've come up with a better reason to why Asaka was assumed to be a woman. Man all of this is just tiring, I wish Gosho would just move faster already with revealing Rum. Sounds like it's brain wrecking which means Gosho is doing it right at the moment. k11chi wrote: Sounds like it's brain wrecking which means Gosho is doing it right at the moment. Since Kuroda will appear next case, we are likely to get more clues(which I can't wait for), and since he noticed Rumi, maybe we will get some juicy plot development(or maybe it will even lead up to a bigger BO case). So far, the Rum arc has been very great. The ambiguity calls for very interesting variety of theories.